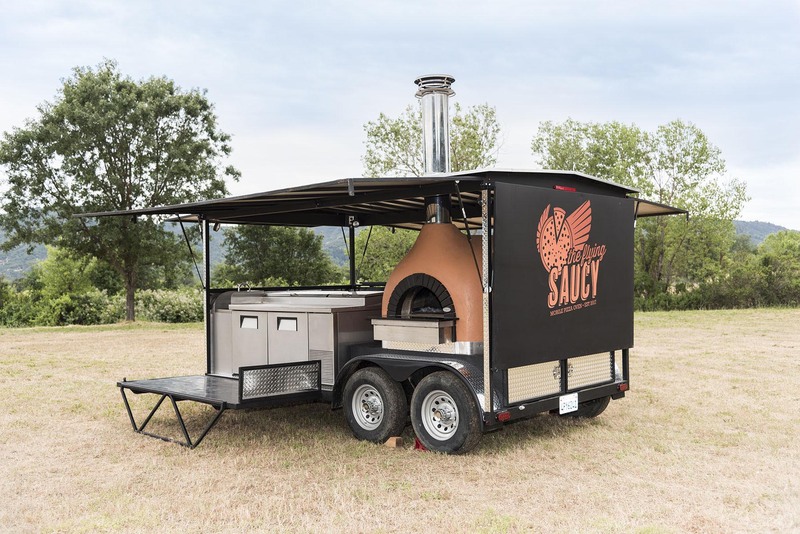 Meet “The Flying Saucy”, a mobile pizza oven for off-premise catering. The perfect option for events of all kinds. Wood-fired pizzas, “live” mozzarella stations, passed hors d’oeurves, antipasti tables and family style meals are just some of the offerings available. Saucy will pull into your venue with their 18 foot long mobile pizza trailer, complete with Mugnaini wood-fired oven, refrigeration, and a mobile tap beer, wine, and fermentation bar. Completely outfitted to do the job and Wow your guests with a truly Sauce-some experience! Perfect for weddings, rehearsal dinners, bachelor parties, corporate retreats, birthday parties, meetings, and more! Serving Sonoma, Napa, and some Marin and Southern/Inland Mendocino Counties. Contact Cynthia at theflyingsaucy@gmail.com or at 415-936-9796 for more information about catered events. Are you a licensed caterer? You can rent our oven, complete with pick up and drop off services for your event. Call us for fees and details.